Abu Dhabi Ports is celebrating its tenth anniversary this year and the occasion proclaims more than the number of years of its existence. The master developer, operator and manager of ports and Khalifa Industrial Zone in the Emirate, has made a long list of achievements over the last ten years. However, for the company’s management, this milestone moment is an opportunity to define its decade-long achievements and build the stepping stones for the future. “We have a strong conviction that our celebration should be beyond marking the number of years. As we happily look at our long list of achievements, we celebrate those that substantially contributed to the development of this great nation, and to the emirate of Abu Dhabi in particular,” says Captain Mohamed Juma Al Shamisi, CEO of Abu Dhabi Ports. As a company with an established vision and mission, Abu Dhabi Ports has a clear yardstick to define its way of ‘celebrations’. “As the maritime trade business enabler in the emirate, and with the support and guidance of our wise leadership, we have been successful in facilitating economic diversification in line with the Abu Dhabi Economic Vision” Al Shamisi says. Abu Dhabi Ports’ increasing investments in maritime infrastructure have boosted the Emirate’s import and export trade business that has also reflected in the company’s year-on-year business volumes. This upsurge and increasing investments in Khalifa Industrial Zone (Kizad) spell out the company’s contribution to the economy. Alongside this visible transformation made in the maritime trade business, and industrial sectors, Abu Dhabi Ports has further evidence to substantiate its impact. A study commissioned by Abu Dhabi Ports and verified by Statistics Centre Abu Dhabi (SCAD) explains that the company contributed more than AED 14 billion to Abu Dhabi’s GDP and generated over 39,500 new direct and indirect job opportunities in 2014. The activities of Abu Dhabi Ports in its entirety accounted for 2.9 per cent of the Emirate’s non-oil GDP, which resulted in rise to nearly two per cent of overall employment in Abu Dhabi’s non-oil economy. This had a greater impact on the national GDP which witnessed a value added impact of AED 18.1 billion and nearly 64,000 jobs were supported. Abu Dhabi Ports’ contribution is expected to increase further with the increasing capacity of the company’s ports and operations based in Khalifa Industrial Zone. Abu Dhabi Ports’ flagship Khalifa Port, the first semi-automated container port in the region, grabbed global attention when the port was ranked third in the world and the first in the region in September 2015 for the highest growth rate. One of the most technologically advanced ports in the world, Khalifa Port, with its world-class infrastructure, also set productivity record of handling 2615 moves in just under 13 hours on July 21, 2015. The container terminal also crossed the important benchmark of 200 BMPH (berth moves per hour) on the same day, proving the maximised efficiencies and increased terminal throughput and capacity. Another achievement of 12.5-minute turnaround time for trucks within the container terminal has raised Khalifa Port’s profile as an international maritime hub. “We are proud that Khalifa Port has also played its role in the UAE’s recent achievement in infrastructure development,” Al Shamisi says. Khalifa Port’s adjacent Khalifa Industrial Zone (Kizad) also immensely contributes to the port’s success story. The integrated services of Khalifa Port and Kizad offer great opportunity, and long-term competitive commercial advantages, including exceptional supply chain efficiencies to clients. With tailored leasing solutions, ready-for-business attitude and dedicated investor support, the integrated trade and industrial hub of Abu Dhabi connects businesses to the rest of the world. Zayed Port, the oldest commercial port and the main city port for the past four decades, caught the attention of global tourism sector for two remarkable feats – opening of the permanent cruise terminal and unprecedented increase in cruise tourist arrivals. The state-of-the-art Abu Dhabi Cruise Terminal, opened in December 2015, is a major landmark for the cruise tourism in the Arabian Gulf. The number of cruise tourists (205,000) visiting Abu Dhabi during this season (2015-2016) represented a five-fold surge since the first cruise season in 2006-2007. Zayed Port is now establishing itself as a premier regional hub for the cruise industry, and general and bulk cargo. The two adjoining ports―Free port and New Freeport―are also extending significant services to the exploration and production sector, which is vital to the economy of the UAE and the region. Musaffah Port, the second oldest port after Zayed Port, offering cargo operations and warehousing, made a major milestone when construction of the New Musaffah Channel at the port was completed in 2011. The new channel is nearly twice as deep as the previous channel and provides unlimited air draught with two-way movement for large commercial vessels. Abu Dhabi Ports Marine Services, a subsidiary of Abu Dhabi Ports, provides a wide range of world-class marine services to all of the vessels calling at the ports. The company received the International Standard for Maritime Pilot Organisations (IPSO) certifications for its marine pilotage service in 2015. All the pilots with the company had already achieved IMO STCW (International Maritime Organisation Standards of Training, Certification & Watchkeeping). All these units help Abu Dhabi Ports to offer more than 100 direct connections to global ports with over 36 shipping lines calling at the ports. Khalifa Industrial Zone (Kizad), the integrated trade and industrial hub of Abu Dhabi, has currently attracted around 90 national and international investors, and a total of 13 million square metres of land leased that represent a total investment of more than AED55 billion. Kizad has also recently attained ISO 9001:2015 quality certification, the latest version of the world’s most popular quality management system standard. Zayed Port and Musaffah Port also bolster the trade and logistic sectors. around 820,000 square metres of warehouses at Zayed Port cater to the businesses in the city. Warehousing facilities of Musaffah Port support the industries in Musaffah industrial area. 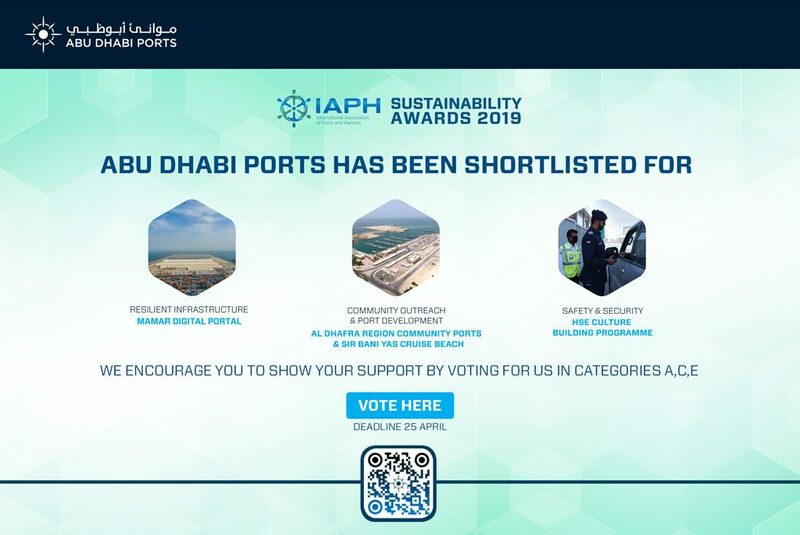 Abu Dhabi Ports has won 11 international accreditations and 26 reputed awards. Three awards of the Abu Dhabi Award for Excellence in Government Performance (ADAEP) were a prestigious accomplishment. The company bagged the award for “the Financially Distinguished Entity” and “the Distinguished Entity in Performance Improvement” in 2015, and award for “the Outstanding Strategic Transformational Project” in 2014. Highly motivated employees have made this success possible. The company treats its employees as valuable assets, which has been reflected in high rates achieved in employee satisfaction surveys. Emiratisation is Abu Dhabi Ports’ top priority in line with the UAE’s national policy. Building on the 47 per cent Emiratisation achieved in 2015, the company plans to accomplish over 50 per cent Emiratisation in 2016. For one of the core objectives of the Environmental conservation, Abu Dhabi Ports has adopted sustainable business practices in all areas of operations. It has made remarkable success in conserving the marine environment while expanding the facilities. An award-winning, eight-kilometre Environmental Protection Breakwater constructed at Khalifa Port is a major contribution to safeguarding the marine environment in the region. The construction of the breakwater costing AED 880 million protects Ras Ghanada Reef, the Gulf’s largest coral reef at around 35 square kilometres and one of the most valuable marine ecosystems in the world. Across Kizad, Abu Dhabi Ports has established comprehensive solid waste and wastewater recycling programmes, and installed state-of-the-art monitoring equipment for conducting both water and air quality surveys. The company was among the first in the UAE to monitor PM2.5, one of the most dangerous dust particles for human health (Particle pollution, also called particulate matter or PM, is a mixture of solids and liquid droplets floating in the air). Abu Dhabi Ports also implemented standards ensuring all buildings within its domain are built with the environment in mind, encouraging green building standards, including water, energy and waste minimisation. A young company achieving stable growth throughout ten years in all major business sectors is an extraordinary feat. The fact that three major sectors, namely container cargo, general and bulk cargo, and cruise sector, attained double-digit Compound Annual Growth Rate (CAGR) makes it more significant. This proves that Abu Dhabi Ports’ heavy investments in the world-class infrastructure, the latest technologies and equipment have considerably attracted more customers to the ports in the Emirate. The company’s investments in new equipment like modern cranes, and Jade’s terminal operating system ­– Master Terminal – deployed at major ports for providing accurate cargo information before vessel arrival, have also contributed to this upswing. Abu Dhabi Ports announced its new annual cargo-volume record in 2015 on the backdrop of a slowdown in the global maritime industry. Thirty two per cent increase in container cargo volumes, 27 per cent in Roll-on-roll-off (RORO) traffic, 20 per cent in general and bulk cargo, and 16 per cent growth in cruise industry attracted the attention of global industry. Abu Dhabi Ports does take note of the predictions made by many analysts about a volatile shipping industry in 2016. “We are proud to state that our double-digit growth in recent years, despite many challenges in the maritime industry, gives us the confidence to look forward to continued growth this year as well,” Al Shamisi says. Maqta Gateway – the first purpose built Port Community System (PCS) in the region – developed by Abu Dhabi Ports, will be a game changer in port operations and the Emirate’s trade business. The system offers shipping lines, shipping agents, customs agents, terminal operators and other government agencies a single point-of-access and real-time information across a wide range of services. A new dynamism witnessed in the port community in the Western Region of Abu Dhabi, since the inauguration of Al Mirfa Port in December 2015, is expected to enhance further this year with the extensive development activities of four other ports. Mugharraq Port, Sila Port and Delma Port will be upgraded to better serve the local community. Sir Bani Yas Island’s beachfront will be developed as the Arabian Gulf’s first cruise beach stopover by third quarter of this year. “The confidence to go-ahead with expansion plans and operational investments is due to our outstanding achievements over the last ten years. With the guidance of our wise leadership, the support of our stakeholders and partners, and the dedicated efforts of our employees, we are sure to accomplish many more in the years to come,” Al Shamisi concludes.